Cassidy is, quite simply, a miracle kitten. Born feral in British Columbia, Canada, he had the misfortune shortly thereafter to traumatically lose both his hind feet. But at 9 weeks of age, he was given the great fortune to be rescued in the very nick of time, along with his brother and protector, Topper, by Shelly of TinyKittens, a nonprofit feline rescue organization in Langley, BC. Shelly has been providing Cassidy (named after Hopalong, naturally) the most loving care, enabling this dear creature to thrive and enjoy life as a “bipawd”, and winning the hearts of people the world over on his very own Livestream channel. His story is inspirational, and you can read about it here, and also here. It also inspired me to create GearGems’ first ever fundraiser designs in Cassidy’s honor! This means that all of my profits from items sold with these images will be donated to TinyKittens. Why would I want to support a small charity located clear across the continent? It’s just because I believe in what they do, and further, I think that TinyKittens deserves as much publicity and support as possible, and to be a top role model for cat rescue organizations worldwide. In short, they do what needs to be done, and they do it right! And now, for the Fundraiser! 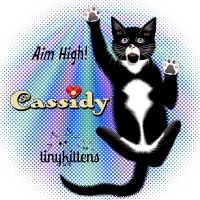 You can purchase a t-shirt, hoodie, or any of a whole slew of neat giftware selections featuring my new Cassidy-inspired “Thumbs Up” and “Aim High!” designs. See examples below, and click the links for further options. Just in time for the holidays, help me to help Shelly and TinyKittens take care of Cassidy, and let many other kittens and pregnant cats get a good start in life before finding their loving forever homes! Or if you don’t want to purchase anything, that’s fine – just go there and donate directly. They will appreciate any gift, large or small! Just a brief, but significant, addition – If you share this fundraiser with others, please make sure to send them the link to this page, and not directly to the Zazzle pages. 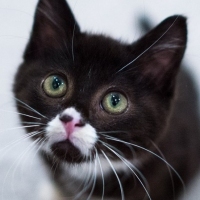 With their referral system, I definitely get more money to donate to TinyKittens when shoppers go through my links below, whereas Zazzle keeps a larger percentage for themselves if people go directly to Zazzle. (The prices are exactly the same, regardless!) Thank you to everyone for visiting! 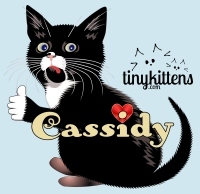 Please support TinyKittens and Cassidy. As we’ve all seen, he’s a little fighter! And if you’d like, please feel free to check out the rest of the site!